Next week marks the 100th anniversary of the first production (as opposed to home-made, one-off) travel trailer and on Monday the modern-day RV industry will kick off a year-long celebration. Ground-zero for the festivities is sure to be the RV Museum and Hall of Fame in Elkhart, Indiana, and last week RV historian Al Hesselbart was kind enough to give me a tour of the collection. But while there are priceless gems here at the museum, one bit of RV history Hesselbart covets is this 1930’s Curtiss Aerocar Travel Trailer. Aviation pioneer Glenn Curtiss, who also designed and built bicycles and motorcycles, came up with the design for this aerodynamic fifth-wheel travel trailer and there are just a few of them still in existence. 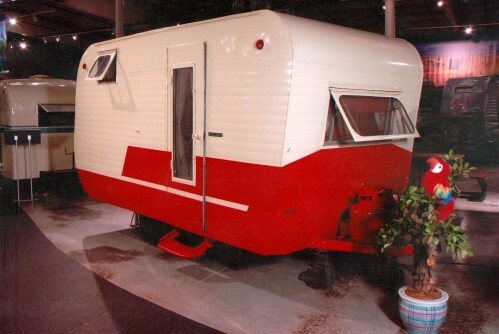 Al Hesselbart knows where each and every one of them is and has his eye on this one, which he says belongs to a friend who hasn’t quite yet made up his mind about donating this trailer treasure to the RV Museum.